This is a reminder to place your order for the annual fundraiser t-shirt. 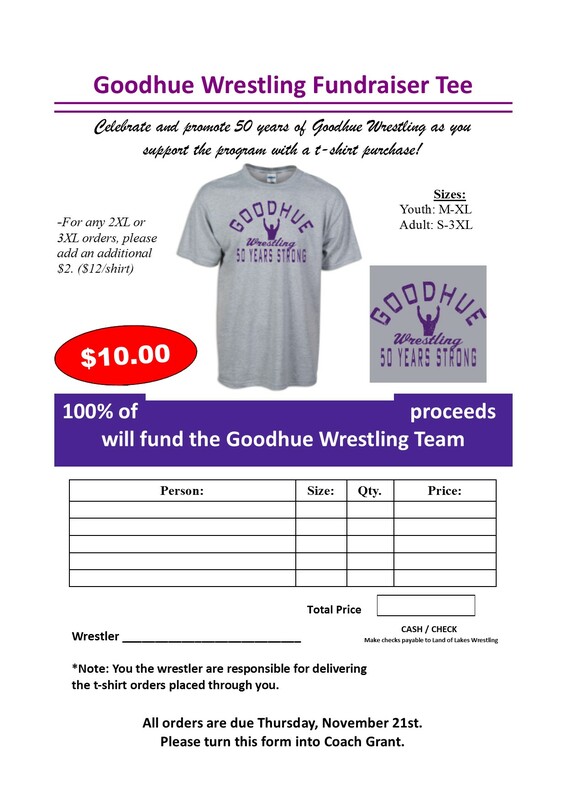 This year we’re celebrating 50 years of Goodhue Wrestling! Please have your orders submitted by the end of practice on Thursday, November 21st. Contact a coach or wrestler if you would like to order one and have not been asked. Both events will be held in the wrestling room. Wrestling apparel will be available at both meetings to try on sizes and submit before the November 15th order deadline. From 5:00 – 7:00 p.m., parents and wrestlers will have an opportunity to come in and pay their program registration fees, leave a singlet deposit, order headgear, exchange/sell shoes, and more. So come in and get these details out of the way and greet new Elementary Head Coach Cliff O’Reilly. At 7:00 p.m., the Parent-Athlete-Coach meeting will begin for wrestlers in the Jr. High through Varsity programs. Annual agenda items include topics such as season event and practice calendar, safety, eligibility, and more. Also plan on meeting new Jr. High wrestling coach hire Daren Wingert, who is currently a junior at UW-River Falls. NEW! Nutrition Meeting: At the conclusion of the PAC meeting, anyone wishing to is welcome to stay for a short, voluntary nutrition meeting. My hope is to briefly share an overview of my thoughts on in-season nutrition so your wrestler(s) can maintain energy levels, stay healthy, and maintain and grow their strength levels. So I will cover some basic food and hydration concepts, and then open the floor up to parents and wrestlers for a Q and A about any questions they have regarding nutrition, weight control, and more. 8th hour wrestling for our 7th and 8th graders has already started this week. The season officially kicks off November 18th. If you’re in need of shoes for the season, please contact Coach Grant as soon as possible so the group order can be submitted. With a steep discount off of regular retail prices, we can save you money on the shoe on top of any shipping or gas costs. Remember to make your check out to “Land of Lakes Wrestling”. See the flyer linked below for the two options this year! Inner Drive Wrestling in Rochester has opened registration for its winter elementary program. Sign up for 1 or 2 nights a week (Sunday/Monday). The first practice starts December 8th. More information, including cost, is available on the signup sheet below.